Passes are no longer available online, but may still be purchased inside the Welcome Center between 9 AM and 6 PM. The 14th Annual Film Festival presenting independent films in 3 venues over 5 days. February 27, 2019 - March 03, 2019. The All-Festival Pass includes VIP parties in addition to film screenings. This pass allows entry into all film programs. It allows the pass holder First-Tier priority seating up to 20 minutes prior to the start of program on a first come, first served basis. First-Tier pass holders may access programs as they arrive after priority seating ends as long as seats are still available. Each screening requires a seat voucher which will be given to attendees prior to entering the theatre based upon availability. Seat vouchers are specific to each individual screening. This pass is NOT transferable and nonrefundable. 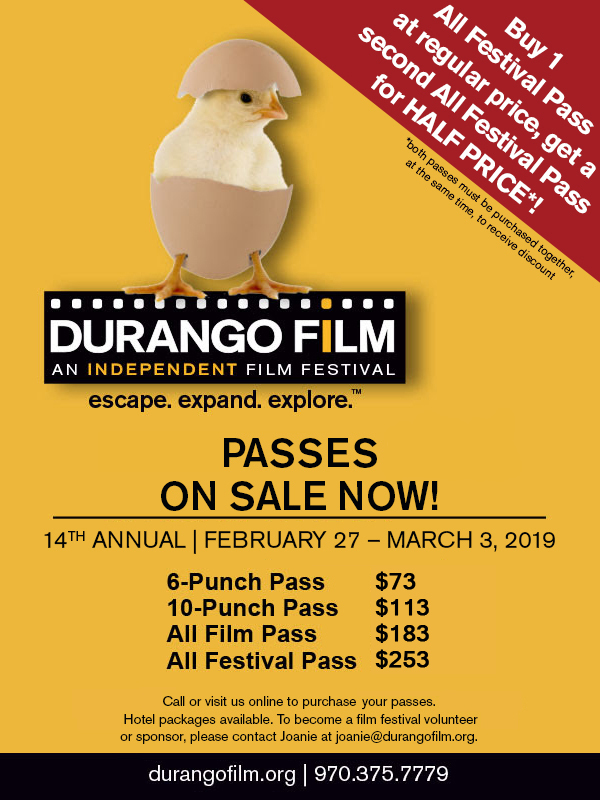 For additional pass restrictions, see the Festival and Pass Information section at Durango Film's website. Sorry, no rain checks or refunds. Passes do not guarantee seating. No replacement of lost or stolen passes, with the exception of the All Festival Pass and All Film Pass, which may be replaced at a cost of $25. Pre-purchased 2019 festival passes can be picked up at the Will Call Desk inside the Durango Welcome Center at 802 Main Avenue in downtown Durango. Will Call hours of operation are: Monday, February 25 through Saturday, March 2, 2019 from 9:00 am – 6:00 pm. Closed Sunday. Buy one All Festival Pass at regular price, get a second All Festival Pass for HALF PRICE*!